Some of you may already be aware that we have a second CD in production. It’s finally so close to being done that we just can’t wait any longer to announce it here. We’re getting to the final stages of post-production and have only a couple months left to go before it’s ready to release. This new album marks a clear divergence from the style of the first. After we had finished immersing ourselves in the parlors of 19th-century France and striving to see the world through the eyes of Chopin himself, we took a step back and asked, “which way now?” We discovered the answer to this question within the repertoire we had already been playing for years—a set of three pieces by Enrique Granados. We realized that playing these Spanish dances for our audiences had always been our favorite moment of a performance. They felt good under our fingers, people loved hearing them, and they were just fun. 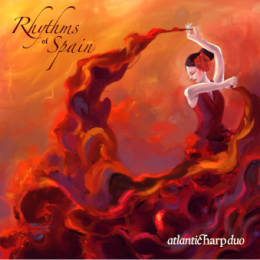 Spanish music is so satisfying to play—it’s passionate and expressive, sensual and rhythmic. It was a natural choice to explore the genre further. When we heard rumors of a transcription for two harps of Ravel’s Alborada del Gracioso, we knew we had to track it down. Then Marta discovered a beautiful piano suite of scenes from Spain, composed by Manuel de Falla, which we undertook to transcribe ourselves. Our program came together piece by piece. Last October, we took everything we had collected and made our way to a brand new little recording studio out in Brittany, France. This was an adventure in itself, which began with an awkwardly large, manual transmission rental truck that we picked up in Nantes (western France). Marta fearlessly drove this beast—with Elizabeth navigating beside her—to the Camac harp factory, in Mouzeil. We were met there by Jakez François and Eric Piron, who had generously agreed to loan us the use of two harps specially for our recording. We got to choose from among a whole selection of harps they had available, and even were treated to a tour of the factory itself! While it drizzled light rain all week, we spent every minute of those seven days holed up in the studio—playing, tuning, listening, tuning again, and playing some more. It was a beautiful and comfortable place to work, tranquil and secluded, and fantastically supplied with state-of-the-art equipment. After an intense recording session, the editing seems long and drawn-out by comparison. It takes so much more time to finesse raw takes into a final product. Part of that process is making space between listening sessions, so we can judge the results with fresh ears. It’s turning into something we’re excited to show you. Keep an eye open for it here!